Palmantier's Motel saved and open for business! 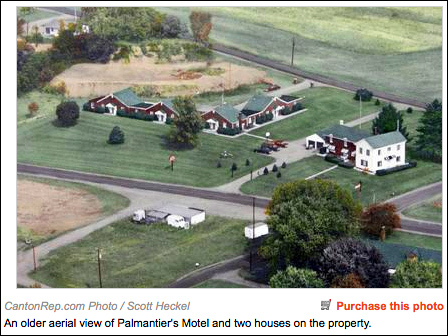 My husband and I have the same dream so we went to the auction and purchased the Palmantier’s Motel. We fell in love with the place when we saw it. We had to have it. My mother was the long time owner of the Akron Turnpike Motel. She too had a dream and we helped her make it happen with her motel. Now we plan to do the same with ours!! We purchased it in July and we are now open. So for all you folks who stayed there in the past please return and make it happen. 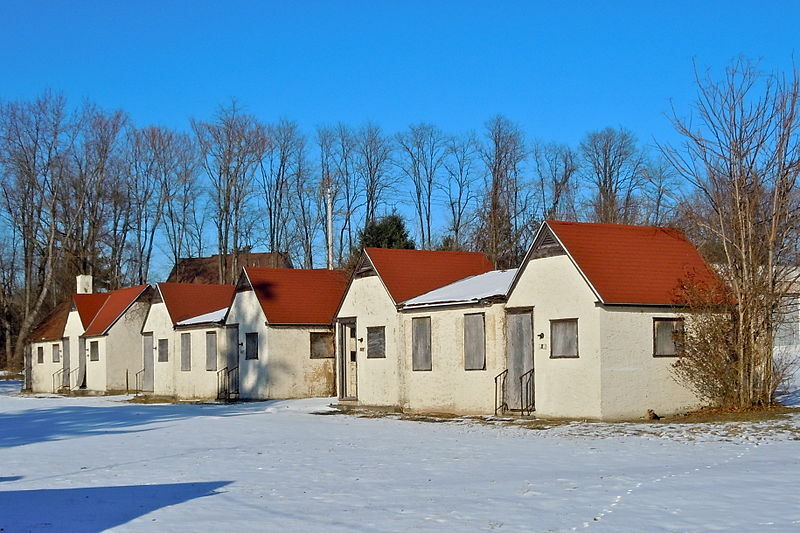 Palmantier’s Motel, opened 1947, is a classic 9-unit motel along the Lincoln Highway in eastern Ohio. Segeti put it up for auction, saying he was struggling. The beautiful motel is within sight of the famous stretch of Baywood Road paved in red bricks (bottom center of photo). The new # for reservations is (330) 868-6000. Flickr friend loungelistener wrote to alert us that the Bon-Air Motel sign is no longer found at the abandoned property in central Ohio. It was a popular photo stop for those following the original Lincoln Highway through Williamstown. Here is an old photo from loungelistener; you can read others’ comments about his photo here. Looking through my computer files today I found this postcard scan of Weaver’s Motel along the Lincoln Highway on the east side of Greensburg, Pa. 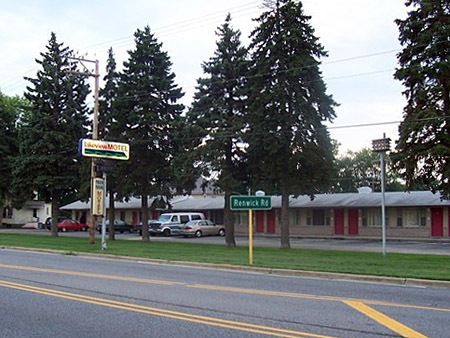 When I began researching the highway in Pennsylvania two decades ago a few remnants of this motel remained. Judging by Google Street View, what looks like the main building of the tourist court still survives but that’s it. Fans of the Goshen Motor Lodge’s vintage sign knew it was a matter of time before the classic 1950s shape would be replaced, The once-exuberant sign along the Lincoln Highwy in northern Indiana declined in recent years, and friends on Flickr reported that new owners planned a purely plastic replacement. Sure enough, as seen below in a photo by Spiny Norman, plastic has replaced neon and vintage plastic atop the original poles. Unfortunately, buying a plastic sign seems easier and cheaper than maintaining an old one, and to many owners, new conveys better. True, some people might pass by a motel for having an old neon sign, but a well-maintained sign and place will build a good reputation. Below is the sign as I saw it last year. BTW, Spiny’s Goshen’s Lincoln Highway blog should be an inspiration to towns all along the LH as to how you can document and promote your section of the LH. You’ll find a link to his site added to the right. Restored Colo Motel Reopens in Iowa! Closed for 12 years, the Colo Motel has reopened, giving Lincoln Highway tourists a new-style, old-fashioned lodging option in central Iowa. It is part of the Reed/Niland corner complex that includes a cafe and gas station, both also restored. The cafe is operating and is a must-stop itself; the 1920s gas station is for display only but is set to house a country-style store. 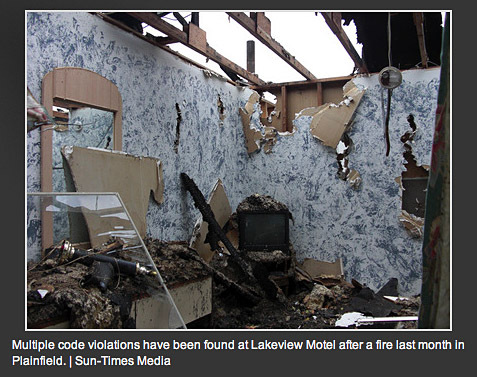 The motel’s six rooms rent for an affordable $49.99 per night or $175 for five consecutive nights. Scott Berka, Colo city clerk, says that other than “waiting for some of the furniture to arrive,” the rooms are complete with cable TV, wireless internet, central air, pillow-top mattresses, and room service from the café. The Colo is on the forefront of restoring mid-century motels for 2-lane tourists, and also gives locals a lodging option for out-of-town guests. Above: Stuart Huse, one of the owners of Flat-Top Concrete & Construction, the prime contractor for the project, finishes the woodwork. Above photos courtesy Scott Berka. An article in the Nevada [Iowa] Journal reported on the opening, and quoted Berka and Sandy Wilfong, manager of Niland’s Café and now the Colo Motel. She praised the retro-stryle rooms and appointments such as wrought iron headboards and curtain rods, and quilts on the beds. Come Spring, Wilfong hopes to have a farmers market at the corner on Saturdays. 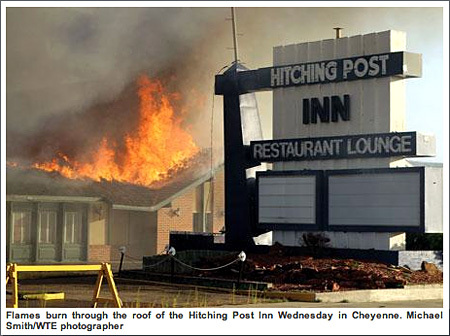 The motel is at 18 Lincoln Highway in Colo. Reservations are taken through Nilands Cafe: (641) 377-3663. To learn more about the complex, go to the Colo Iowa web page and click Reed/Niland corner at the bottom of the left-hand column.